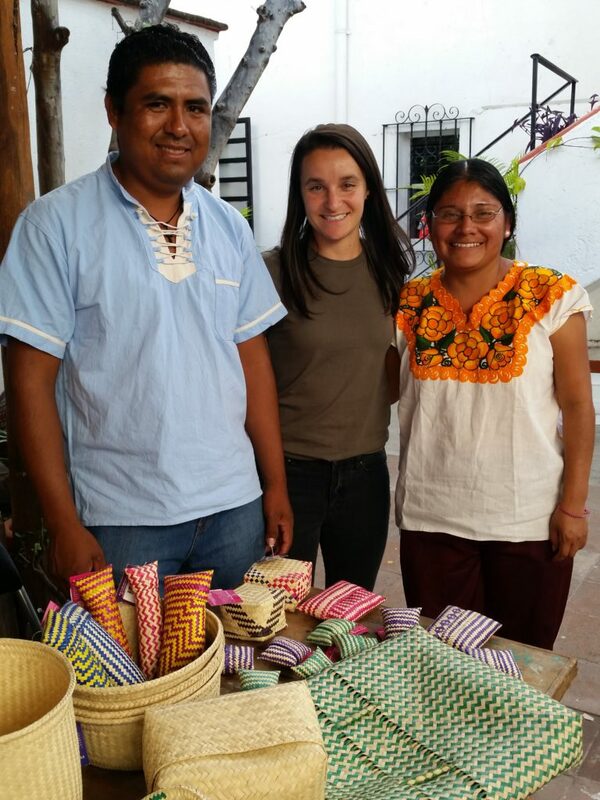 Artisan Box Curator, Genna Gershkow, and GlobeIn’s Local Manager, Pamela Chavez, visited artisans in Oaxaca, Mexico. 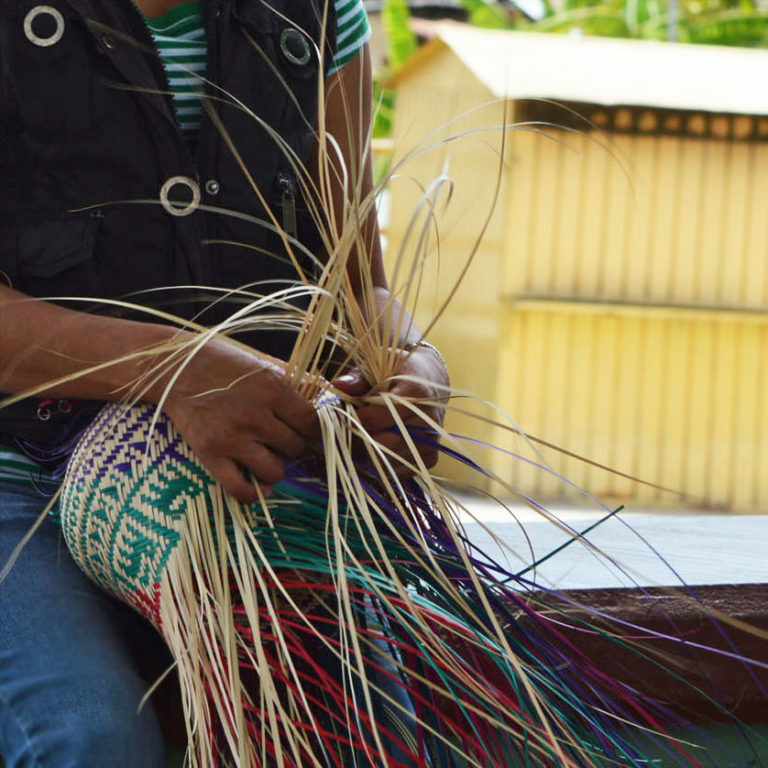 These artisans create the signature GlobeIn palm leaf baskets. These are reflections from their inspiring journey. We woke at 4:30 am. The world was still dark. It was a three-hour journey to rural Oaxaca. Sleepy but overwhelmed with curiosity, Pamela and I jumped onto a bus. As the sun rose, we made our first stop. It seemed like the middle of nowhere. In the half light, we navigated our way down a dirt road. A woman stood in the middle of the road. She waved to us. Next to her was a small, cement-brick home surrounded by tall grass. Behind it, the silhouette of mountains. The woman was Marina Antonio Lopez. A backstrap weaver, Marina is one of GlobeIn’s first artisans and has been a GlobeIn partner for almost four years. This was our first meeting, yet her warmth made me feel like we had known each other for years. Marina led us into her kitchen where we met her husband Leobardo, better known as Leo. A tall man whose smile was kind and genuine, Leo left field work to shatter the constraints of rural machismo and joined his wife in the artisan sector. He now earns a better living and the two are building a brighter future, together. A palm leaf basket filled with soft bread rolls sat on the table. Marina stirred a pot of hot cocoa and proudly told us that the kitchen we were sitting in was built from income earned through GlobeIn. Marina and Leo produce backstrap woven crafts. However, they run an integral part of GlobeIn’s basket operations. When GlobeIn expanded and customer demand for palm leaf baskets increased rapidly, entrepreneurial Marina reached out to us. She wanted to manage our Oaxaca operations. 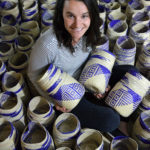 Since then, she has gathered and shipped palm leaf baskets to the U.S. every month and increased GlobeIn’s weaving team from two to forty artisans in the first few months. 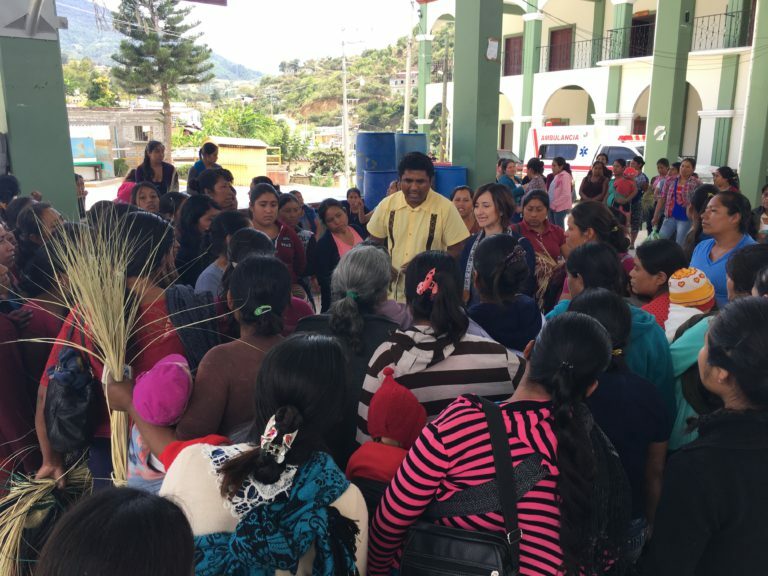 GlobeIn became a well-known job source in rural Oaxaca. Before meeting Marina, I already admired her. Her story inspired me and I speak highly of her whenever I tell people about our artisans in Oaxaca. From a single-room home with no windows or doors, to a newly constructed kitchen, I saw GlobeIn’s impact right in front of me. The fresh bread, the hot cocoa, and the generous welcome overwhelmed me with feelings of accomplishment. 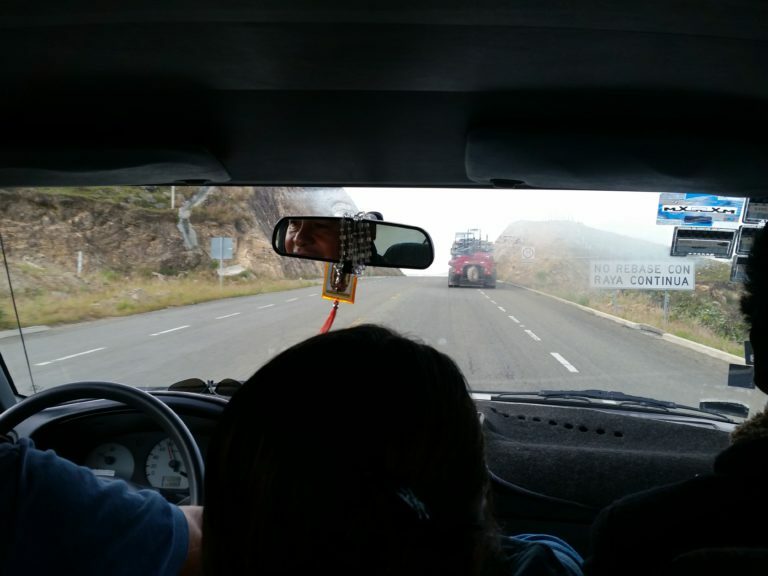 Crammed into a small truck with Marina, Leo, a driver, and two basket weavers, we set off for the small town of San Cristóbal Amatlán. We were meeting our primary basket weavers and some newer members. The truck meandered through the mountains and narrow dirt roads. When we arrived, there was a crowd of a hundred women and children. A few were weaving, partially woven baskets in their dye-covered hands. The scene was surreal. As Pamela and I exchanged looks of disbelief, we realized that Marina had gathered these women to show us how much of an impact GlobeIn was making. We spent several hours speaking to the women about GlobeIn and the concept of fair trade. In turn, we acquainted ourselves with these women. Some were already part of our weaving team, but others were there because they wanted to join. They told us of their struggles and goals. Many of them sell their baskets to the city’s market vendors, but they said GlobeIn offered a better price that would better help support their families. Our main weavers are also our artisan leaders because they train and support other women as GlobeIn grows. 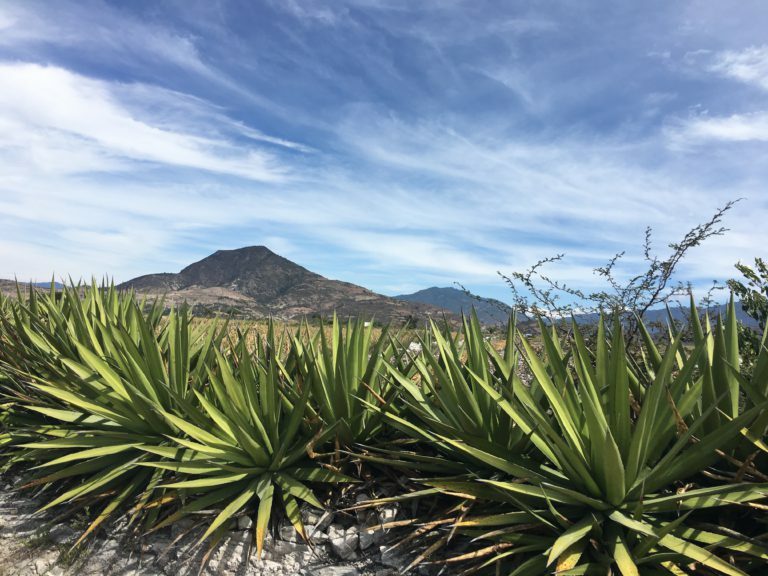 Paula, who has been with us for several months, took a moment to tell us about her family’s dream to start a business producing mezcal, a distilled alcoholic beverage derived from the agave plant. She explained that they started to build their workshop a year ago, but did not have the money to finish. As she handed us shots of mezcal, she proudly stated that since working with GlobeIn and earning a better income, her family was able to continue building and the workshop is almost finished. We visited her home and mezcal distillery on our way back to Oaxaca City. Again, the impact of GlobeIn’s business model was right in front of us. I was reminded again that the same change and improvements could happen anywhere. The following day, we met with Juan and his wife Juana at their city store. Juan is a determined and hard-working person who strives to provide his family with a better life. He used to travel eight hours by bus from his hometown every week just to sell his palm leaf baskets and hats in Oaxaca City. We sat in chairs Juan had made out of wood and palm leaves, sharing potato chips with hot sauce, and listened to Juan and Juana’s story and everything that had changed since GlobeIn visited him over a year ago. Since 2014, Juan has been saving the income he earned through our company to pay for his oldest daughter’s education, which was his dream. When his daughter became pregnant and put a halt to her schooling, Juan used the money to take classes that would teach him how to improve his business. With no knowledge of how to write or use a computer, he earned a degree that inspired his daughter to get her own. As he developed his business and exposure, the government recognized his work and helped him purchase the beautiful store we sat in. His daughter helps him run the shop. Additionally, he bought a truck with income earned through his business and GlobeIn, cutting his traveling time from 8 to 4 hours. Throughout our conversation, Juan continuously expressed gratitude to his wife for always supporting him and staying by his side. He welled up while telling us the story of how they fell in love and stayed together despite the obstacles. I expressed my admiration for all of the success and accomplishments they had achieved. Juan and Juana continue to weave a better future for themselves and their daughters. While he still works with GlobeIn to produce his original design of square-shaped baskets for our customers every month, he and his family also strive for more opportunities and a better life. Pamela and I spent our last day with Marina and Leo. At this point, the four of us had spent everyday together, meeting and learning about current and potential GlobeIn weavers. Marina and Leo had experienced everything with us. They had taken care of us and made all of the people we met with along the way feel comfortable. I also got to know them better. I felt like we were among friends. We sat in the weaving workspace and discussed the previous days, what we had felt and what we could do as a team moving forward. And as we conversed and planned our next steps, some of Marina and Leo’s family members started to trickle into the home. As they arrived, each one took a loom, strapped it around their back, and began weaving. The members of both families weave – parents, siblings, nieces, and even nephews. It is tradition. 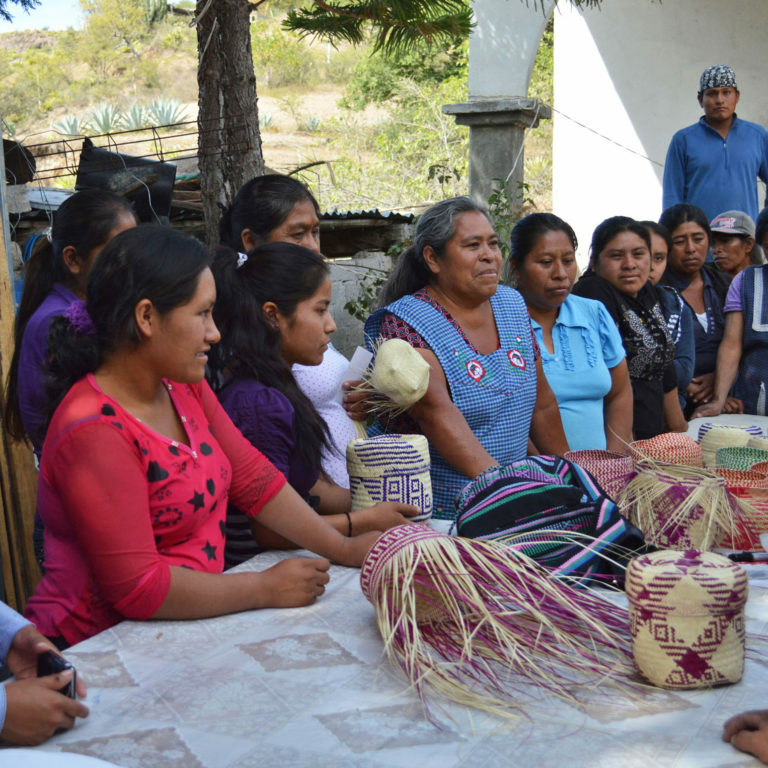 Although it is known in Oaxaca as “women’s work,” the men in both families have left the fields in favor of weaving. We sat in the kitchen as Marina served traditional Oaxacan tlayudas, a tortilla topped with beans, shredded meats, cheese, and other vegetables. Marina, Leo, and other family members explained how important weaving is to their lives and traditions. Both Marina and Leo’s fathers endured health problems in the past. Weaving helped the family earn enough money to bring them back to good health. Weaving was the heart and soul of this family. The rest of the afternoon was spent watching the family weave, sharing laughs as we bonded together. Each family member lives a life as complex as the patterns they weave. The tenates, or palm leaf baskets, that GlobeIn sends customers each month are beautiful, functional, and skillfully woven. But, there is more to them. Behind each basket is a person. Inside each pattern lay tangible improvements for the lives of the people in the distant hills. As our customer base increases, our impact in Oaxaca does as well. 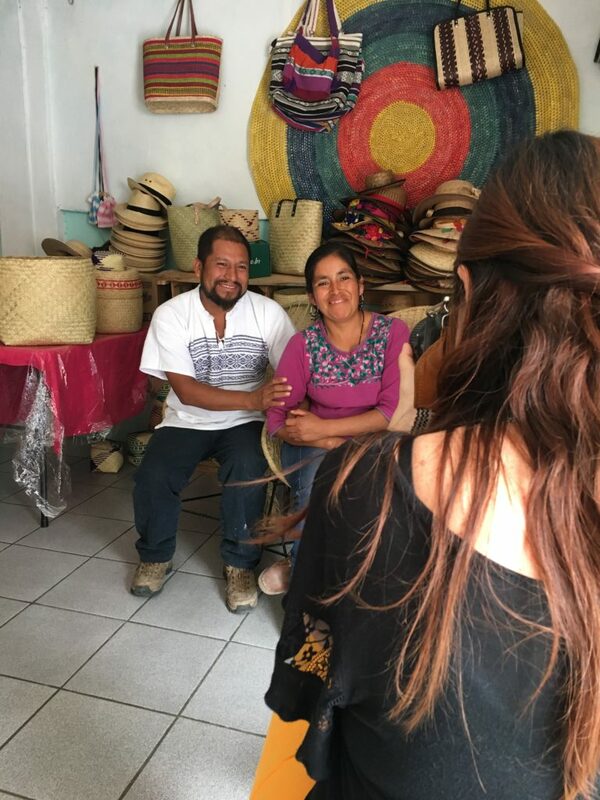 Having met the artisans in Oaxaca and seeing the potential impact, I left Mexico with renewed determination to continue working hard for our artisans so that they, and others, can empower themselves.